Also, color tint doesn't have sense for stationary picture (or when you move near the planet). Eye can't detect the depth based on color tint. At least my eye. The depth becomes visible only when you move at orbit-size distances, but then the color tint have no sense anyway. Thanks for responding, I don't want to waste much more of your time on this - Color shift is indeed subtle and hard to control even for us painters to get right and it is most effective in landscapes, etc where there is subject continuity. Seeing your counter example though, gave me another idea - which is to just use intensity changes for BOTH the orbital position AND depth cuing. I think the orbital position "trick" works well because of the discontinuity of intensity on the ellipse - this abrupt discontinuity is what catches the eye, not any particular absolute intensity values, so in the following example I left the orbital position intensity values as originally screen-captured, but then added another intensity shift (Photoshop neutral gradient - maybe a bit overdone :-) on top of the simulated angled ellipses to indicate the planar depth cuing - this seems to work pretty well - preserving your original position information AND creating the distance (and inclination) hinting information I was looking for. See what you think. If you are sick of this conversation, I'll understand :-) But cheers, and thank you for all your good work! When you hover your mouse over one of the HUD icons, it shows the name of it. It would be great it if also showed the hotkey associated with it. I want learn them and it would be easier than going into the menu every time. 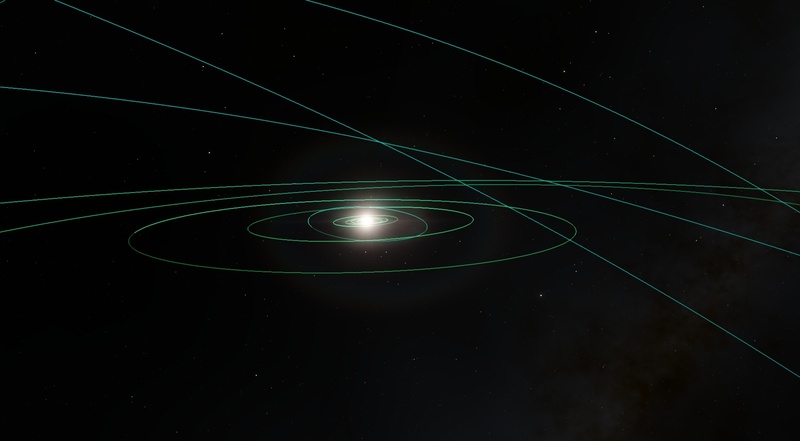 Small suggestion (sorry if it has already been suggested): When orbits are visible, clicking on a line selects the corresponding body (higher priority than background stars). I would also like such an option. I have many times thought how nice it would be if you could just hover over the icon it shows the hotkey. What is your opinion about the new auto exposure normal mode? Personally, I like it but maybe it needs to be slightly toned down a bit. Right now the earth (or any planet with atmosphere and a relatively high albedo) looks too bright when looking at the horizon - especially when at dawn / dask. Which I like it actually but maybe it is not too accurate? However, real pictures/videos of earth sometimes look like this so maybe it is more accurate after all. If it is too much trouble to tweak, leave it as it is - it looks Holywood like so its cool! I love the ability to set what units the game uses, but one option that I think is missing is millions of km for the middle distances. I've always heard solar system distances expressed in millions of kms rather than AU, and don't find AUs nearly as intuitive. I've always heard solar system distances expressed in millions of kms rather than AU, and don't find AUs nearly as intuitive. I've always felt the opposite, that AU was most intuitive, but I agree that more options are always nice. n0b0dy, "normal" mode is unfinished, you should ignore any issues that it has. Interstellar space, intergalactic space, space inside globular clusters, surface of a desert, beneath a hydrocarbon ocean, etc. Currently with the life section of the planet editor there's only one option for life. Today I was trying to add life to Europa. While on default it obviously won't be there because no one knows for sure it is there I decided to put some life on Europa using the planet editor. However the life always generates as multicellular and terrestrial, with the origin of life being panspermia despite me wanting the life to be native and to be sub-glacial. I suppose AUs are more intuitive to most people, but I'm so used to millions of km that the opposite is true for me. I really like the new auto-exposure, but I would suggest lowering the threshold of when it reduces the exposure a little. Currently, it makes the Earth look like it did in 2001: a Space Odyssey when you look at it from a bit of a distance. It's an unfinished feature. I suggest just ignoring its issues, and treating it as an experimental use-at-your-own-risk sort of thing. 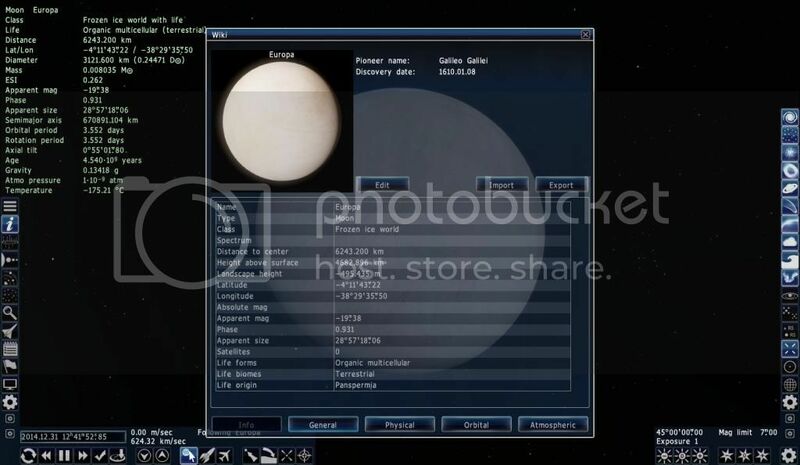 If you're going to be adding life to planets (or modifying planets in any way) you have to edit the catalog script. The editor is not meant for that, and doesn't have every possible option built into it, not to mention the fact that it can't save changes.